You may have noticed the subtle (and some not-so-subtle) threats in yesterday’s Leprechaun Laffs. Without going TOO deeply into the back story involved let me just say that I inadvertently caused insult to Lethal’s majestic felines and by proxy, his stunningly beautiful wife, Molly. I have brought great shame to House Dragon and will try, with this post, to make amends. Stay tuned after my apology for more. 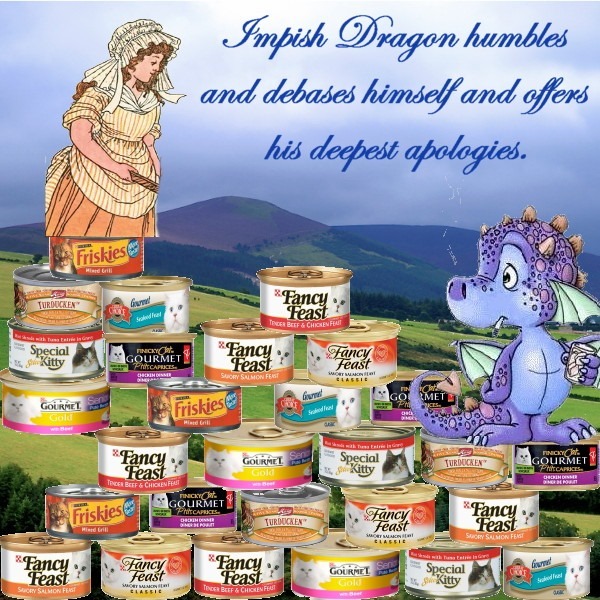 To Mrs. Leprechaun and the two beautiful and wickedly intelligent cats, whom I am not worthy enough to even call them by name, I humbly, respectfully and whole-heartedly beg your forgiveness for me and the embarrassment that I have brought to all of dragon-kind. For Mrs. Leprechaun, one-tenth of my gold for a gift card to the jeweler of your choice. I hope that this, in some small way, makes up for my unthinking and unkind remarks. Well campers…you have laid witness to my attempt to bring this horrible incident to a close. I hope you will all do what you can to put this incident behind you. But I want you all to know, that if I die or disappear, even under explainable circumstances, you will remember this…and take appropriate steps. 1.) Back up your posts dummy! We use MS Live writer to write them and it samvs them to our hard drives automatically after posting. 2.) DO NOT PISS PEOPLE OFF BY ATTEMPTING TO SPAM PROMOTE YOUR BLOG ALL OVER THEIRS! This pisses us tech savvy bloggers right off and we hack you to express our displeasure! Have a Craptacular Inbox Full of Spam Day! YOU are stupid and don’i make any sense!!!!!!!!!!!!!!!!! Thank you for your comments, but in all honesty, the deadline for no-meaning, nonsensical out of context comments was the second Tuesday of last week. That is, unless you were trying to flame Don, for his out of context comments that also don’t make a lot of sense. If that’s the case we must insist that you desist in your insistence of trying to assist Don with his comments. He, too has a right to write nonsense in the comments. Might I suggest you hire a 5th or 6th grader to help you properly compose a comment… and a spell checker is available in the blog. Those red squiggly lines under the word means it’s spelled wrong. Just FYI for next time.